According to the European Commission, buildings are responsible for 40% of energy consumption and over 36% of CO2 emissions in the EU. Within commercial buildings, it is estimated that HVAC equipment’s account for at least 39% of energy consumption. Improvements in the energy performance in HVAC equipment is therefore a critical success factor in bringing to life Ireland’s vision to reduce GHG emissions. But what solution is available? 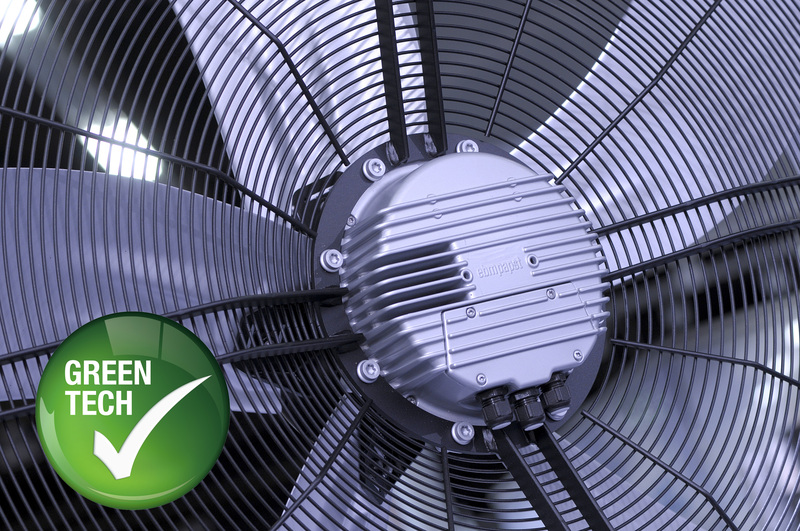 Low carbon technologies such as EC fans are recognised as being the latest innovation in energy efficient air movement technology with specifications of EC fans and motors growing in popularity in many areas of Europe. This is primarily driven by energy reduction legislation such as the NEEAP directive and more specifically to HVAC, the ErP Directive which enforces stringent efficiency requirements for fans in the power range between 125 W and 500 kW. But what is an EC fan and what makes it so special? Plainly speaking, EC technology refers to a mains fed, brushless, permanent magnet motor with electronic commutation. Fans within ventilation and air conditioning units are usually powered by asynchronous AC motors which drive the impeller by way of a belt. These take up considerable amounts of space within air conditioning device, making installation complicated. In addition, belt driven systems require ongoing maintenance and replacement due to the number of wearing parts over the course of operation. The efficiency of asynchronous drives is low with efficiency levels between 20% and 70% depending on the shaft power. This will have a negative implication on power consumption in most applications. Considering these factors, EC technology are a superior alternative. EC fans attain an efficiency level of up to 90% meaning not only better utilisation of primary energy, but also reduced heat loss and longer service life. The interaction of motor, electronics and aerodynamics, means that EC fans not only exceed in energy efficiency capability but due to the optimised commutation technique and the aerodynamic impellers, they operate extremely quietly. In addition, EC fans varied speed control make it possible to adapt the air volume to the respective requirements. EC fans contain compact motors, which makes them fully interchangeable with AC products for retrofit. So rather than spending capital on buying brand new equipment, it is possible to place EC technology into existing equipment as a retrofit installation. Despite the obvious benefits that can be achieved from adopting EC technology, there are certain barriers hindering industry adoption. The first and major been the initial purchase cost in comparison to their AC counterparts. Today’s market is flooded with HVAC equipment’s that simply meet mandatory minimum energy conservation standards. On a value proposition perspective, these products compete mainly on price. Although there are substantial savings to be achieved over the long run with EC technology, decisions are generally based on purchase cost. For this reason, more emphasis needs to be placed on more long term financial benefits such as the pay back periods and life cycle cost. With EC fans payback periods can be as little as 12 months with savings running into the hundreds of thousands with the installation of a few fans. Another major barrier is technology risks and uncertainty. In particular those associated with the application of new and unfamiliar technology which can lead to major financial penalties. These range from lack of compatibility, disruption either in down time for installation and system failure. Such risk may cause decision makers to feel uncomfortable about making the initial investment or ‘rocking the boat’ when it comes to their HVAC solution. Emphases and continuously innovation in the areas efficiency gain and flexibility is needed in order to encourage the integration of high efficiency fan and motor in retrofit HVAC installations. Some manufacturers are addressing compatibility fears and installation complexity by developing innovative capabilities such as ‘plug and play’ modular solution. Within such fans the electronics and motor form one unit here by saving space but also facilitating easy installation. As the motor and electronics in the motor system are already perfectly adjusted to one another, additional electronic filters and shielded cables are unnecessary, as is an external motor protecting switch. As a result, there is no longer the need for cost-intensive adjustments before commissioning or for grounding and shielding measures. In addition, these modules are not only suitable for varied industrial applications, they are also open for use in refrigeration counters, in home ventilation systems or for cooling switch cabinets. As evident, low carbon technologies for heating and cooling commercial buildings need to be pivotal in the development of low carbon strategies in Ireland with EC fans playing an important role. As a simple and cost-effective retrofit solution with a short payback, upgrading to EC technology for HVAC solutions should be an easy choice. Nonetheless factors such as purchase price and technological risk and uncertainty are discouraging industry adoption. These barriers demonstrate the important role long term financial benefits and continuous innovation plays in accelerating the rate of adopting EC Technology for the more risk averse operator. With so much to gain for both industry and the environment, there is no reason not to incorporate EC technology into future incentives and programmes for energy efficient technology and systems. Aubren represents ebm-papst in Ireland and has available for clients full engineering design and consultancy service. At its helm is a team of designers, engineers, fabricators and project managers all with deep expertise in the conditioning, control and monitoring of air within a wide range of applications including data centres, medical/healthcare cleanrooms and residential HVAC. Aubren is driven to proving innovative solutions which meet all the latest quality and energy efficient standards, such as CE, UL and Passive Home. Operating out of a 3,000m2 facility, Aubren’s highly-specialist advanced manufacturing and operation site has achieved several key industry standards including; ISO 9001, ISO 14001 and OHSAS 18001.